Lord Jeffrey1 Amherst was commanding general of British forces in North America during the final battles of the so-called French & Indian war (1754-1763). He won victories against the French to acquire Canada for England and helped make England the world's chief colonizer at the conclusion of the Seven Years War among the colonial powers (1756-1763). 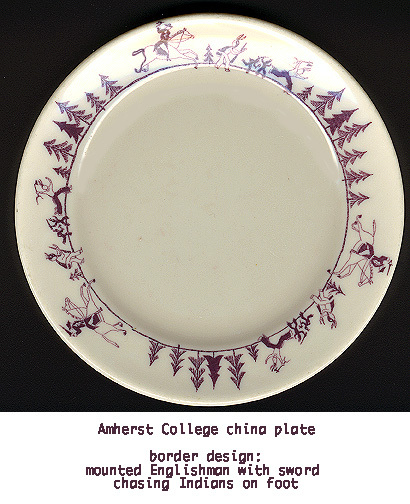 Amherst College china plates depicting mounted Englishman with sword chasing Indians on foot were in use until the 1970's. Click on the pictures to see full-size images in new windows. Amherst College Trustees voted January 26, 2016, to allow the college administration to decide whether to abandon Lord Jeff as a symbol: "The College, when its own resources are involved, can decide not to employ this reference in its official communications, its messaging, and its symbolism…" The trustees further stated that the college inn—the only place where Lord Jeff's name officially appears on a building—will be renamed in a way to "reflect its deep connections with Amherst College and the town of Amherst." As to the unofficial presence of Lord Jeff as a college mascot—at sports games and elsewhere in student and alumni life—the trustees stepped behind the principle of "free expression," saying the college has no official mascot and "the College has no business interfering" with unofficial mascots. Significantly, the trustee statement made no pretense of doubt about the root of the controversy, saying, "a central reason [to dislike the symbolism of Lord Jeff] has always been his suggestion, in wartime correspondence, that smallpox be used against Native Americans." In contrast, recently as January 14, commentators in major sources like the New York Times and the New York Review of Books described the smallpox letters as having "no conclusive proof" and "allegations" rather than fact. See d'Errico, "Amherst's Lord Jeff Out: Lessons Learned," Indian Country Today Media Network, January 27, 2016. 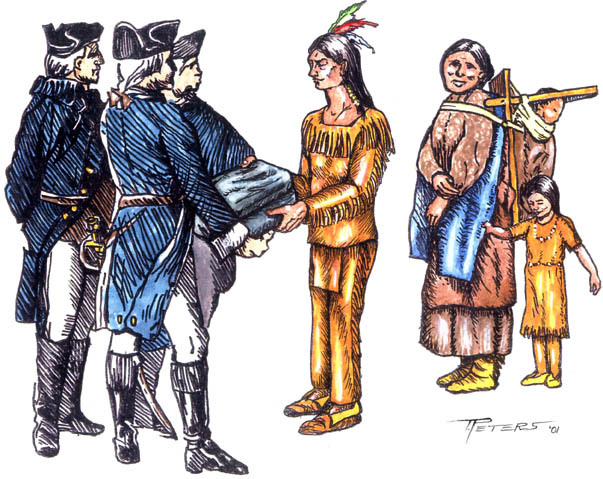 Some people have doubted these stories; other people, believing the stories, nevertheless assert that the infected blankets were not intentionally distributed to the Indians, or that Lord Jeff himself is not to blame for the germ warfare tactic. Drawing by Terry R. Peters, Medical Illustrator, Topeka (Kansas) Veterans Administration Medical Center. Used with permission. Click on image to view full size in new window. The documents provided here are made available to set the record straight. 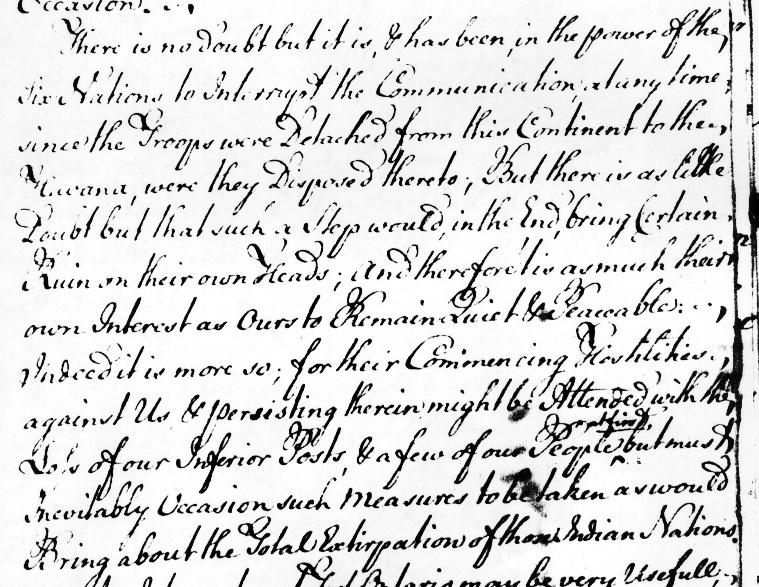 These are images of microfilmed original letters written between General Amherst and his officers and others in his command during the summer of 1763, when the British were fighting what became known as Pontiac's Rebellion. The documents provided here are among Amherst's letters and other papers microfilmed as part of the British Manuscript Project, 1941-1945, undertaken by the United States Library of Congress during World War II. The project was designed to preserve British historical documents from possible war damage. There are almost three hundred reels of microfilm on Amherst alone. The microfilm is difficult to read, and paper copies even harder. 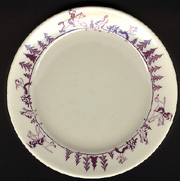 Nonetheless, the images obtained by scanning the copies are sufficiently clear for online viewing. The images are of key excerpts from the letters. An index is provided to show by microfilm document number the location of the imaged documents in the microfilm set. Text files of the excerpts are also provided. 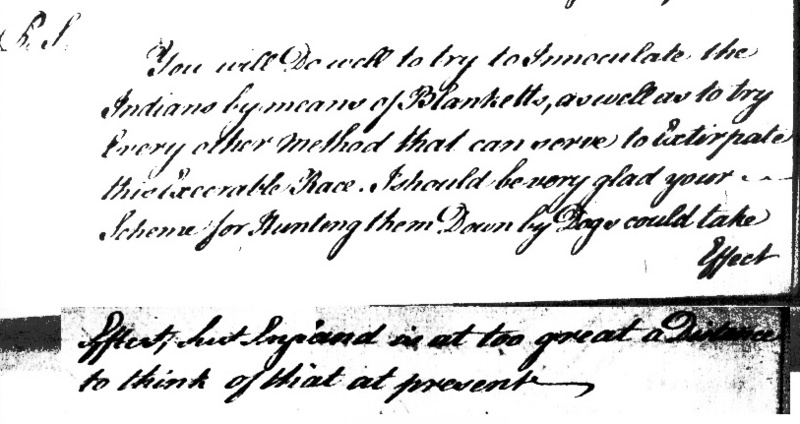 These letters also discuss the use of dogs to hunt the Indians, the so-called "Spaniard's Method," which Amherst approves in principle, but says he cannot implement because there are not enough dogs. In a letter dated 26 July 1763, Bouquet acknowledges Amherst's approval [125k] and writes, "all your Directions will be observed." 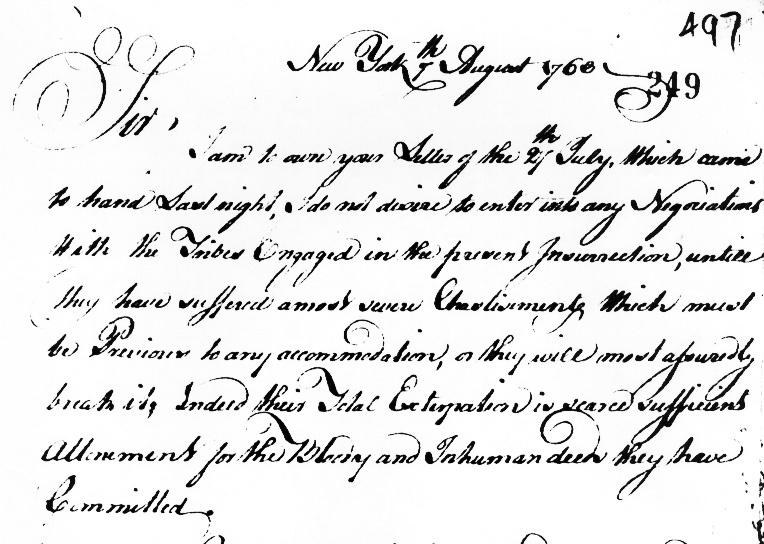 I have not found this letter, but there is a letter from Bouquet to Amherst, dated 23 June 1763, [189k] three weeks before the discussion of blankets to the Indians, stating that Captain Ecuyer at Fort Pitt (to which Bouquet would be heading with reinforcements) has reported smallpox in the Fort. This indicates at least that the writers knew the plan could be carried out. It is curious that the specific plans to spread smallpox were relegated to postscripts. I leave it to the reader to ponder the significance of this. 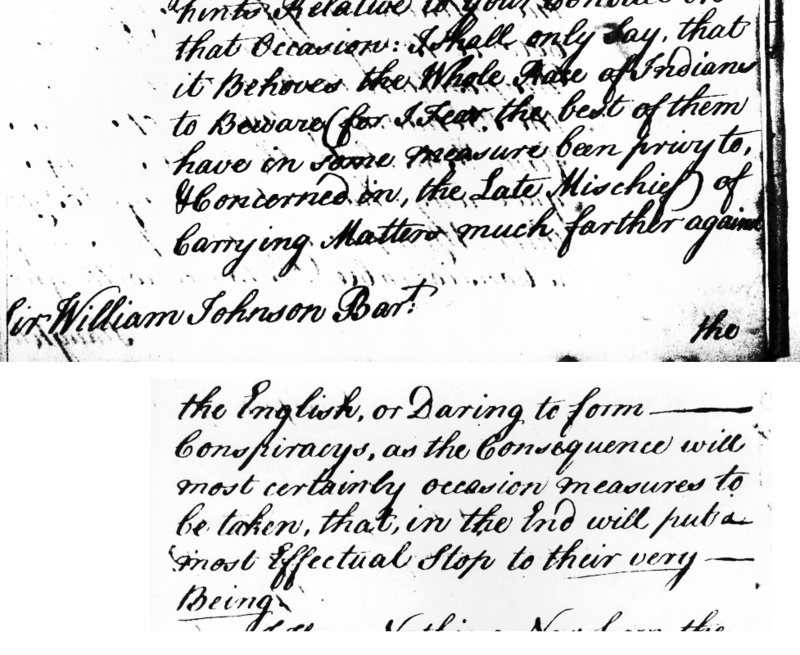 "...put a most Effectual Stop to their very Being" (Amherst to Johnson, 27 August [292k]; emphasis in original). 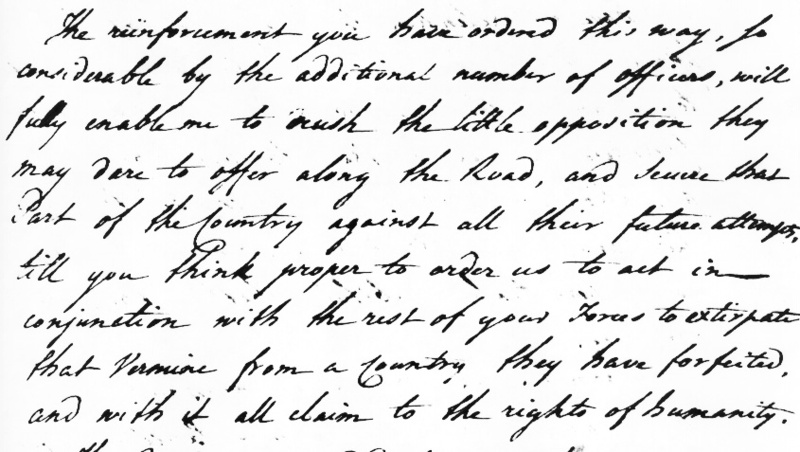 Amherst's correspondence during this time includes many letters on routine matters, such as officers who are sick or want to be relieved of duty; accounts of provisions on hand, costs for supplies, number of people garrisoned; negotiations with provincial governors (the army is upset with the Pennsylvania assembly, for example, for refusing to draft men for service); and so on. None of these other letters show a deranged mind or an obsession with cruelty. 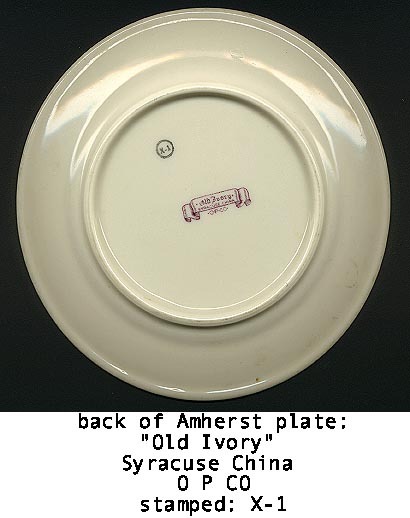 Amherst's venom was strictly reserved for Indians. 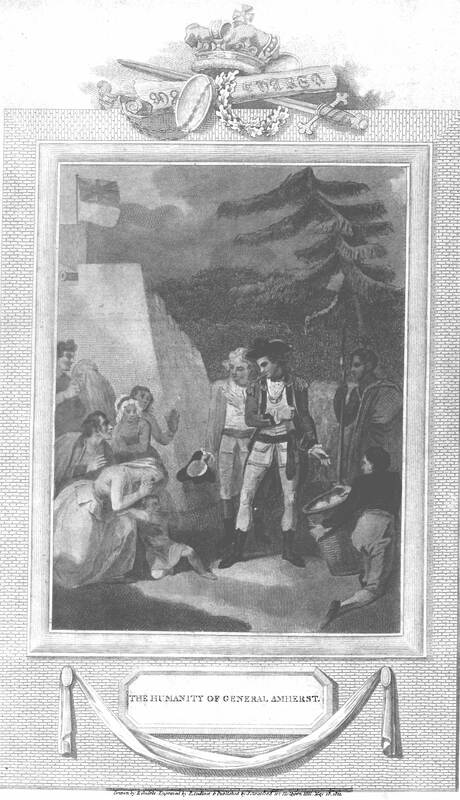 Drawing by R. Smirke, engraved by P. Audinet & published by J. Stratford 112 Holborn Hill, May 18, 1811, entitled "The Humanity of General Amherst." Courtesy of William Plowden, London, England, who writes: "The image appears to refer to the end of a siege or battle in which some Caucasians have surrendered to General Amherst who is, presumably, treating them more humanely than may have been expected." Note the curious figure, right background, who appears to be West Indian. Click on image to view full engraving in new window. All in all, the letters provided here remove all doubt about the validity of the stories about Lord Jeff and germ warfare. 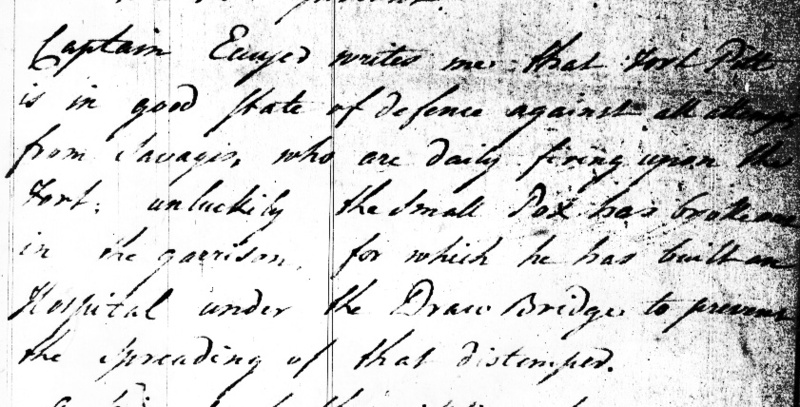 The General's own letters sustain the stories. ... we gave them two Blankets and an Handkerchief out of the Small Pox Hospital. I hope it will have the desired effect. 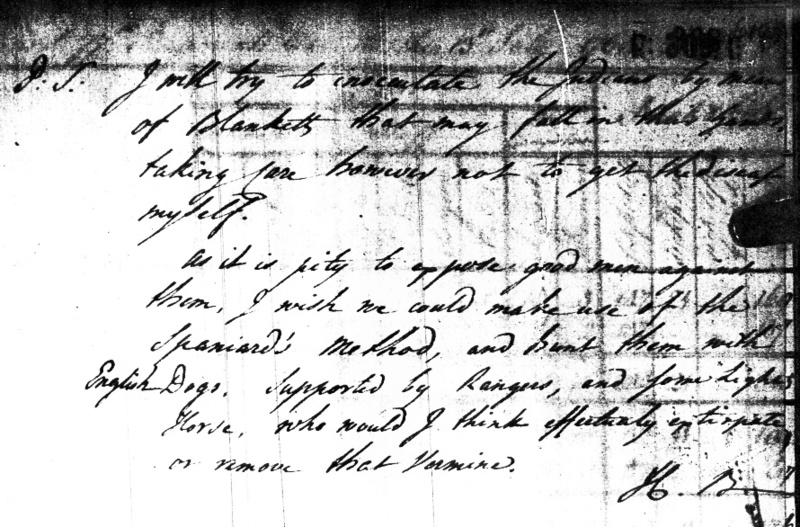 Trent's Journal confirms that smallpox had broken out in Fort Pitt prior to the correspondence between Bouquet and Amherst, thus making their plans feasible. It also indicates that intentional infection of the Indians with smallpox had been already approved by at least Captain Ecuyer at the fort, who some commentators have suggested was in direct correspondence with General Amherst on this tactic (though I have not yet found such letters). Go to index of microfilm images and text files of excerpts. A mild form of smallpox virus, Variola minor (also called alastrim), is transmitted by inhalation and is communicable for 3-7 days. The more serious smallpox virus, Variola major, is transmitted both by inhalation and by contamination; it is communicable by inhalation for 9-14 days and by contamination for several years in a dried state. For further medical information, see Donald A. Henderson, et al., "Smallpox as a Biological Weapon: Medical and Public Health Management," Journal of the American Medical Association Vol. 281 No. 22 (June 9, 1999). Compared to the span of life of a culture, the Great Death was instantaneous. The Yup'ik world was turned upside down, literally overnight. Out of the suffering, confusion, desperation, heartbreak, and trauma was born a new generation of Yup'ik people. They were born into shock. They woke to a world in shambles, many of their people and their beliefs strewn around them, dead. In their minds they had been overcome by evil. Their medicines and their medicine men and women had proven useless. Everything they had believed in had failed. Their ancient world had collapsed. A.2. Elizabeth A. Fenn expands on this theme in her book, Pox Americana: The Great Smallpox Epidemic of 1775-82 (NY: Hill and Wang, 2001), discussing widespread accusations and examples of biological warfare on the American continent during this period. Selected excerpts from the book are presented on a separate page. An excerpt from Blackbird's History, with Jaskoski's introduction and commentary, are presented on a separate page. Center for Biosecurity, an independent, non-profit organization of the University of Pittsburgh Medical Center, with its base of operations located in Baltimore, Maryland. The Johns Hopkins Center for Public Health Preparedness, provides training and education for control and prevention of bioterrorism and infectious disease. Copyright permission is granted for educational use, provided that credit is given to the site author and the URL is included. Author's Statement: My motivation in undertaking this project was to make good on a promise I made to Floyd Red Crow Westerman (Dakota), who asked me to "find the proof" about the smallpox plans to counter the many commentators who denied anything like that had ever happened. Floyd told me he wanted to make a movie that would "put a knife into America's heart and pull it out to heal America." I think what he meant was that facing historical truths would heal America, though this would kill its illusions. Floyd passed on before he could complete this film project, but his inspiration lives in the material available to educate those who will learn.